I decided to buy this book for my trip to Malaysia after wanting it for quite a long time. In spite of the not-so-special cover and the title which I (even after reading the book) don’t get. What did get me exited were the amazing reviews on Goodreads, and the general prospect of the book. All the characters, even the supporting ones you don’t know as much about, feel like they were walking around on earth one day and then accidentally fell into the book. Most of them are very likable and make you wish they are real, and the less obviously likable ones leave you with complicated feelings towards them, which is good. I think people their opinions of them will vary, what will start quite a few interesting conversations. The plot is great, never slow, and you won’t be able to put the book down. The subplots are very good too. 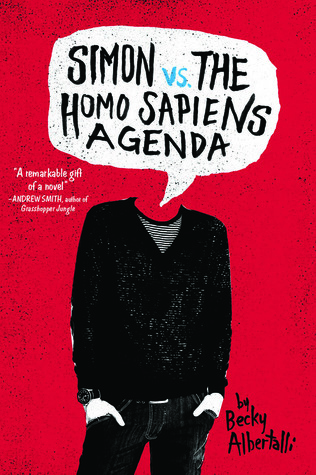 In this book there is an email exchange between Simon and Blue. The emails are easily my favorite part of the book, they made me giggle, chuckle, snort and fall in love with Simon and Blue as they were falling in love with each other. Even though I guessed who Blue was quite early on in the story, it didn’t make it any less exiting or fun, and ‘The Big Reveal’ might be my favorite paragraph of all time. This book is honestly the best book I have read in the romance genre. It is cute and fluffy and light and will leave you thinking about Simon and Blue long after it has ended. There’s this pause. We’re still looking at each other. And there’s this feeling in my stomach like a coil pulled taut. “It’s you,” I say.